OK, you need business cards printed today. Don't worry, you're not alone. Every day we help customers get their business cards printed fast, on high quality 350gsm card stock, at competitive prices. 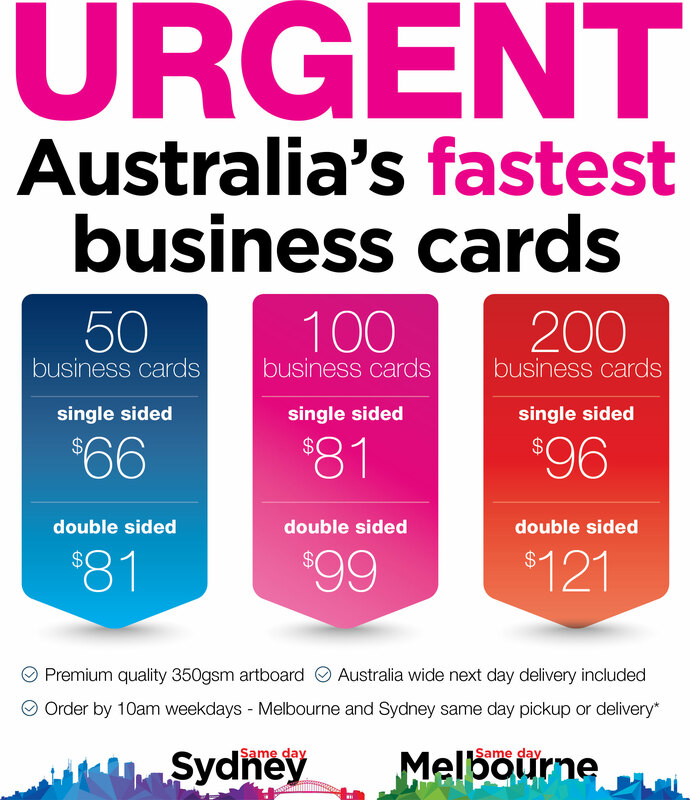 Efficient systems and state of the art digital printing presses mean we can print your urgent business cards fast, on premium quality business card stock and cost effective. Next day delivery Australia wide is included in all orders. We dispatch orders the same day as the order is placed by Australia Post Express Post satchel for deliver next working day. If you have a custom size that does not fit these dimensions, please email or call so we can make special arrangements for your custom design. We will accept any size from 80mm x 40mm up to 90mm x 55mm. If you need a business card setup created, our designers can help. Whether it's a simple text layout or a fully developed business card design concept through to finished art, call us on 1800 70 80 28 to find out what we can do to help you. To order, select a quantity and sides (single sided or double sided), upload you file, then place your order. It's that easy. Artwork must be supplied as a single or two page Press Ready PDF file with 3mm bleed if bleed to edge is required. User-friendly website. Easy to order. High-quality business cards. Thank you. Very quick and easy to order. Friendly customer service and business cards were also of high quality. Will definitely go back. Thanks!